Float activated switches for opening or closing electrical contacts at a preset fluid level. 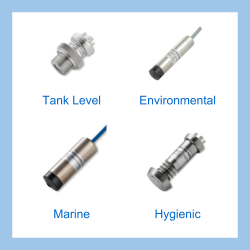 Float fluid level switches are threshold contact trip devices which typically consist of a buoyancy component which is typically a sealed hollow ball or cylinder which will float on a fluid, and either a shaft assembly for vertical mounting, or a hinge mechanism for horizontal mounting. As the level increases and decreases a float will be pushed up or drop down. The float can be connected to a hinge that opens and closes or slides along a shaft. The position of the float along the shaft or the opening and closing of the hinge can be detected by various means. A vertical mount sliding float type level switch will have a permanent magnet incorporated into the float which slides up and down the shaft. A magnetic reed switch is positioned along the shaft to the required level set point. When the float pashes over the reed switch it will open or close the level switch circuit. A horizontal mount hinged type float level switch will incorporate either a microswitch or a magnetic reed switch, which is activated by an actuator or lever connected to the float. It is possible to fit more than one switch to shaft type float switch, and provide fluid level control for a number of separate processes which are activated at different levels. Browse other help pages associated with the same topic group as this Float Fluid Level Detection page. Send us your enquiry for a product associated with this Float Fluid Level Detection page, and get assistance with selecting a product for your application.